By Jon Wyatt - In 1963 Alfred Hitchcock's masterpiece 'The Birds' premiered on the silver screen and it has a cult following to this day. 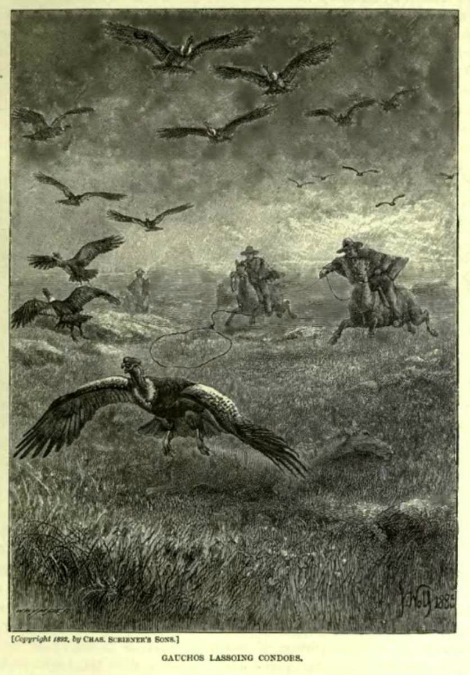 The story about flocks of birds taking revenge on humanity is fictional but terrifying attacks on people do happen and for high suspense it's hard to ignore this tale. In 1888 the SS Talisman an iron-hulled screw-driven cargo fish carrier of 153 tons left Liverpool, England, for South America; she was under the command of a Captain Putt. The ship was new, being launched in Glasgow in 1882, and she was 112 ft (34.14 m.) long, 19.1 ft (5.8 m.) wide and powered by a 50 HP steam engine and auxiliary sail (she would be later sunk by a German U boat in 1917). During the passage she received severe storm damage and stopped at the Falklands for lengthy repairs. 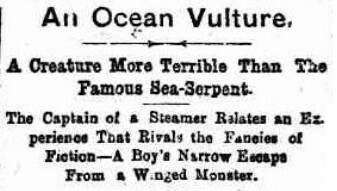 “The attention of every man on board was given to the two men in the water, but when one sailor raised his eyes and saw an enormous bird make for the boy he emitted a cry of terror, which was joined in by every one as they saw it... it was an enormous creature that no two men would care to battle with under any circumstances. “When Banning raised his eyes and saw the bird his first thought was to turn around and make for the ship. Fear took possession of him and his strokes grew less powerful. “Seeing Banning's danger James Gray jumped in after him. “Just as he reached the water the great creature reached the boy, who was growing very faint. “At first the bird seemed undetermined what to do. It pecked at the boy about the body, heeding not the shouts of the sailors, who sought to frighten it away. “It was some time before the boat could be lowered and by the time it was down into the water and manned the boy had gone down once. “His sudden disappearance surprised the bird, which was about to turn its attention to Banning, when the boy came to the surface again. I ran to the cabin and returned with a rifle to shoot the bird should it grow ugly. “When I got on deck the first thing I saw was the strange creature rising into the air with the boy, and its mate, which suddenly appeared, almost as large, was attacking Banning. “He was on his back, dodging the beak of his adversary and swimming toward the vessel with all his might. I never was more excited in my life. I hardly knew what to do. The boy was being carried away and was up thirty or forty feet in the air. “'Shoot the bird!' yelled the mate, running about the deck like a crazy man and shouting at the top of his voice orders that were not obeyed. “In shooting I, of course, ran the risk of killing the boy instead of the bird, if, indeed, he was not killed by the fall; but there was not much time to think of this; the bird was still rising and after a hasty aim, I fired. “It was an excellent shot. “A wing fell helpless, as if I had broken it, and the bird tumbled down into the water. The second bird, when it saw the boat approach, left Banning and made a fierce attack on one of the boatmen, striking him with its foot a blow that felled him to the bottom of the boat. Another of the crew raised an oar and hit the bird with all his might, when it flew way. “Banning, Gray and the boy were picked up. The latter was unconscious, but after a good rubbing he was brought to. Banning was bleeding about the face and more or less injured about the body. “The wounded bird fought viciously when an attempt was made to capture it. It was finally lassoed and taken on board. Three weeks after it died, and is now at Valparaiso [the port near Santiago, Chile] being stuffed. “The boy said that before he went down he felt himself losing consciousness and grabbed at the enormous bird that was hovering over him. He caught its feet and held on with the grip of a drowning man. He partially regained his senses in the air, but thought he was higher up than he really was and did not dare to let go. “I have seen many big condors and other large birds,” continued the captain, “but never any winged thing as large as this. The stretch of its wings was over fourteen feet [ 4.27 m ]. The head and neck were destitute of feathers, and the former, which was much flattened, was skinned and bleeding. It had the big, strong beak of an albatross, and the plumage though somewhat darker, was not unlike that of the latter bird. Its feet were only partially webbed. 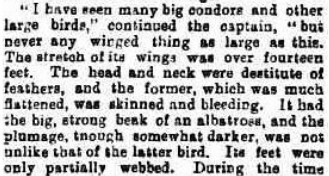 During the time we had it on board and until it died it was not seen to eat, but slept constantly, and it took some rough handling to awaken it.” (Source: Sydney Mail 17 November 1888, p1045, reprinted from the San Francisco Examiner). Unless there was a huge unknown species out there, the predators were Chilean condors. Grist for another movie perhaps.